A team first needs to validate that they're solving the right problem for the right audience, in the right market. Only after that should they polish their product. In a perfect world, companies would take a systematic approach to product design from their very first days. But, in reality, early product design efforts can be sporadic for various reasons—for instance, because a product must launch as soon as possible, there’s not enough money at the start, the user base must grow at the fastest rate possible, or the product idea changes constantly in trying to discover an effective business model. Why is this? Product-growth and market-penetration rates are critical in a company’s early days. In fact, they’re more important than perfect technical solutions or high-quality designs. This is true especially for lean startups that employ the minimum viable product (MVP) concept. A team first needs to validate that they're solving the right problem for the right audience, in the right market. Only after that should they polish their product. At that point, a company understands that good design is important to the product’s success. There could be many different reasons for emphasizing design: Competitors might become stronger. A product might receive negative feedback from users or have a poor public image. A product’s user base might be shrinking. Perhaps good design just becomes trendy. Or the focus of a company’s strategy might change from aggressive user acquisition to user retention. Many years ago, my company Mail.Ru Group experienced similar issues. We have about 40 different products, with many versions for mobile devices and tablets—adding up to about 200 products overall. A lot of our products are leaders in their market niches. Our total audience is about 100 million users. At this scale, a global redesign becomes really complicated and requires a certain level of UX maturity. In this series of articles, I’ll write about the levels of UX maturity through which companies with large product portfolios progress. operational—The designer is just an implementer, working on individual design tasks and creating design deliverables. tactical—The designer is an integral part of a product team and deeply integrates design into other product development tasks and processes. strategic—The designer is a visionary or product owner who influences strategic decisions on how to evolve a product. These maturity levels indicate how deeply designers become engaged in product and business management. For each level of UX maturity, there are basic criteria for achieving that level, plus progressively more sophisticated activities for maintaining sustainable growth. Sustainability is a critical part of establishing a systematic approach to design, as well as ensuring predictable quality. This series of articles will discuss all of these aspects of UX or design strategy. 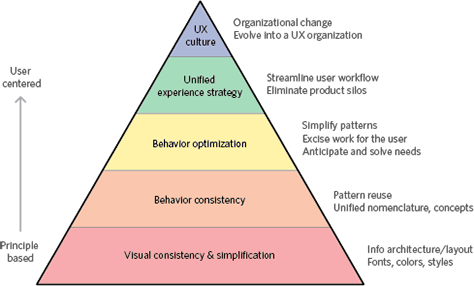 The environment in which User Experience will grow … is dramatically important to the successful implementation of UX strategy. Money to invest in anything other than the company’s basic needs—ensuring a product works and acquiring new users. You must know whether the company and its specific departments have money to invest. People to work on design. You should consider both their experience and their workload. Sufficient time remaining before the next product release. Credibility that would let User Experience make bold decisions without micromanagement from supervisors. It’s important to assess the current availability of resources and whether they meet your needs for UX strategy execution. If you have enough of all of these things—that’s great! But if you lack some resources, how can you get them in the near term and whose approval do you need? What if you break UX strategy execution into several phases, so you can gradually get the resources you need? Perhaps these resources already exist, but you haven’t yet requested them. Having a systematic approach to UX design means building an effective work process that lets you create and enhance designs and integrating this process throughout the whole development cycle. new product and feature initiation—Who is responsible for decisions relating to launching new products or redesigning existing products or features? How do decisions become tasks, and when are they assigned to designers? How do market, competitive, and user research occur? development—What development model does the company use—waterfall, agile, lean? What deliverables do designers provide to developers, and how do they support the implementation process? quality assurance—What does the company mean by quality—basic tests to ensure that a product does’t crash, matches functional and business requirements, has good usability, and complies with design guidelines and the designers’ initial mockups? Can the design team block the release of the product if there are problems with the user experience? marketing—What is the target audience? Are marketing promises true to the actual product? Is the design of marketing collateral good enough in comparison to the quality of products’ visual design? Do they have the right voice and tone? support—When and how does a company help its users to resolve the problems that they encounter when using a product? Are users satisfied with the help they’re receiving? Designers’ participation during development and quality assurance is critical. If the role of a design team is to be more than just that of implementer, their participation is also important during the initiation of a product-development project. In service design, the design team should also enhance support and marketing processes. In a perfect world, user experience is a key part of every step. organizational structure—whether matrix, functional, division, or a combination. How are people distributed across business units, products, departments, and roles? When a company is a startup, a small group of founders and early employees can manage all product-development tasks. They’re generalists who take on all responsibilities and fill all roles. But with company growth comes specialization. People get assigned to specific roles and more employees get hired. So, throughout the product-development process, the organizational structure is changing. If the company is ambitious, it will change often. Furthermore, there are politics. This is not necessary a bad thing like the intrigues that we see in the news and in movies. First of all, you need to consider other people’s interests. This will help you to get their support and to work more effectively as a team, avoiding conflicts. The current processes in any company are rarely fully efficient. Sometimes this is because an organization is young, sometimes it’s a legacy of a crisis within an industry, and sometimes short-sighted management is the cause. So, from the beginning, User Experience should integrate into a company on its own terms. If you need to change something, you should change not only how design occurs, but the company’s processes as well. A successful company is always changing, so the efficiency of its processes always lag behind its growth. Therefore, even once you’be built the best design process you can conceive of, you should always look for ways to improve on it. It’s critical for a company’s top management to understand the value of good design. Only in such a context can you safely make dramatic changes to a product’s strategic direction or design. seeking an appropriate market, a product for that market, or a business model to monetize it—A product ought to change and pivot often—maybe even dramatically—to enable the company to survive. The role of User Experience: user research, defining and validating product hypotheses, and fine-tuning the user experience. growing the customer base and/or profits—The product gets new features or distribution models. The role of User Experience: user research, UX and visual design, and usability testing. customer retention—You need to differentiate your product from those of competitors by becoming more customer oriented, expanding its feature list, optimizing your product for key usage scenarios, and strengthening your brand. The role of User Experience: user research and fine-tuning the user experience. efficiency of product-portfolio management—It’s becoming more important to launch and improve products faster and make design activities easier. The role of User Experience: establish guidelines and standards. getting your product out of a crisis when its customer base, profits, and/or market share are shrinking—Two possible scenarios are making gradual improvements or radical changes. The role of User Experience: user research, UX and visual design, and usability testing. It’s critical for a company’s top management to understand the value of good design. Only in such a context can you safely make dramatic changes to a product’s strategic direction or design. Otherwise, the lack of their support will block your progress in making changes to either a product’s design or your design process. A company’s leaders may even disband the entire UX team. Famous identity designer Paul Rand always tried to work directly with top management so he could be sure that his work would become fully realized, and his clients wouldn’t screw around with it. For a few lucky companies, design is a key competitive advantage and a way to differentiate their brand right from the beginning—it’s a real business driver. When you’re learning about a company for which you’re creating a UX strategy, you can use the various components making up these resources, processes, and priorities lists as a checklist. Together, they paint a portrait of a company. Each company’s strategy is unique, so regardless of whether companies have similar design goals, their execution and the details of a design will differ. For a few lucky companies, design is a key competitive advantage and a way to differentiate their brand right from the beginning—it’s a real business driver. Other companies have founders or early employees who have a strong design background and skills, so build User Experience into their culture from day one. But most companies realize that they need a systematic approach to design only after they’be already achieved business success. So examining a business’s current state is one of the main concerns of the UX Strategist. In addition to this checklist, you should analyze your company using existing organizational maturity models. One of the most notable of these is the corporate lifecycle by Isak Adzes, shown in Figure 2. And to make your task even more complicated, remember that the competitive environment is constantly changing. So to get the most of UX design, your UX strategy must adapt to such changes and solve your company’s current problems and reach its current goals. 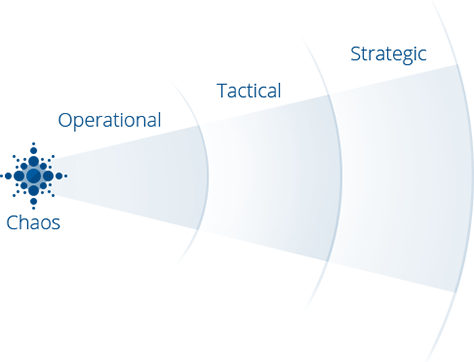 There are three levels of UX maturity—operational, tactical, and strategic. As I’ve stated in the introduction to this article, there are three levels of UX maturity—operational, tactical, and strategic. 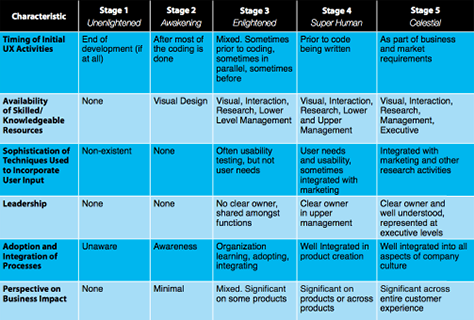 To move up on this UX-maturity ladder, you must understand how a company and its business work really well. Does the company have problems or constraints? Does it have all of the necessary resources? In this overview, I’ll briefly describe all three levels. And in my subsequent articles, I’ll tell you about each level in depth. At the operational level, a UX design team is merely an implementer. The team executes incoming design tasks and creates design deliverables, as shown in Figure 3. The company either hires its first designers or assigns team members who have design skills to the role of designer. Developers are on their own. Somebody has to put user-interface controls on the screen and give them some visual style. The company either hires its first designers or assigns team members who have design skills to the role of designer. Maybe one of company founders has design experience. Designers are outsourced—either before hiring designers onto the team or afterward. Design tasks are completed. Design quality is random. The company begins following a systematic design approach. There are some first successes and relaunches. Executives see problems in consumers’ perception of products in the form of negative feedback, a shrinking customer base, and general criticism in the industry. The company hires a UX leader or promotes someone from inside the company. The UX leader shows where are problems and how to solve them. The company initiates a program of user research and analytics. They achieve some first successes, product changes, and relaunches. The UX team sets up a design process, does short-term and mid-term planning, and establishes a clear way of assigning and approving tasks. The company builds or acquires a UX design team. Ideally, the company hires highly skilled UX designers, but it may be necessary to hire inexperienced or mediocre people to fill gaps at some stages. These people must either grow or go later on. The UX team sets up a process for assigning and approving tasks and does short-term and mid-term planning for design tasks. The team defines workflows for typical projects and tasks, ranging from the creation of new product concepts to providing UX support for current releases. 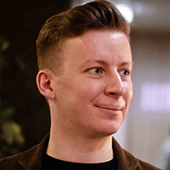 The team chooses their optimal toolset for creating wireframes, prototypes, mockups, and other deliverables; knowledge and document exchange; and planning and efficiency tracking. The team outsources UX resources and involves them in solving either tasks that are not related to product design or in helping with design when there is too great a workload for the team. The team establishes learning, training, and skills-improvement programs to grow designers professionally. The UX team regularly contributes to product updates. The UX designers play an integral role on product teams. 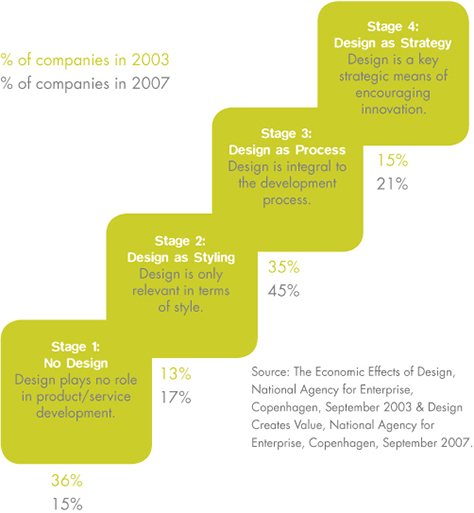 Design is deeply integrated with other product development tasks, as shown in Figure 4. The UX team works effectively in a tight collaboration with the Product team. The UX team works effectively in a tight collaboration with the Product team. Designers feel the pain of developers and managers and vice versa. The UX team can demonstrate the value of User Experience to every product and project manager. These managers understand and support the UX design team and bring them design problems, not solutions. UX designers are the sole owners of design decisions and are in charge of design projects, but work in tight collaboration with product and project managers to solve product design problems. When new product or project managers join the company, the UX team needs to teach them how they can work effectively with one another. The UX design team gains authority, credibility, and trust and always gets heard. All design decisions get made up front by the UX team. Experts in other disciplines like developers, testers, and marketers trust UX designers. They often contact designers directly to solve ongoing problems or ask questions bypassing managers altogether. The UX team engages in mid-term and long-term planning of design tasks. A quality-assurance process gets set up and covers design implementation reviews, usability testing, and ensures designs solve business goals. Products become more consistent as the UX team establishes common visual-design elements, interaction principles, and information architecture patterns. The company’s product portfolio now has a recognizable look and feel. Supporting the company’s current products and launching new ones gets easier. The company’s product portfolio now has a recognizable look and feel. First-model products get launched, and the unification of the company’s product portfolio coalesces around them. Their visual design, interaction principles, and overall quality are good enough to provide a basis for the whole portfolio. The UX team provides scalable design solutions, which should be tested on several products before rolling them out to the whole portfolio. The UX team designs new products and redesigns other products around these model products. The team creates UX design guidelines that specify visual design, interaction design, and information architecture. These establish standards that designers, managers, and developers must follow. These guidelines and standards include mockups and specifications. UX guidelines have a technological basis and provide frameworks and unified code bases. Design is integrated into building blocks that developers use every day. The company builds dozens of products based on guidelines that are built into frameworks, making it easier to control and evolve their designs. Thus, the UX team makes changes to groups of products all at once instead of focusing on each instance. Design principles guide the company’s efforts in building and evolving products. These are high-level commandments that help the team to choose the best design decisions from several alternatives. The entire product portfolio gets updated to conform to unified UX design guidelines and standards. The user experience is consistent across the entire portfolio of products. 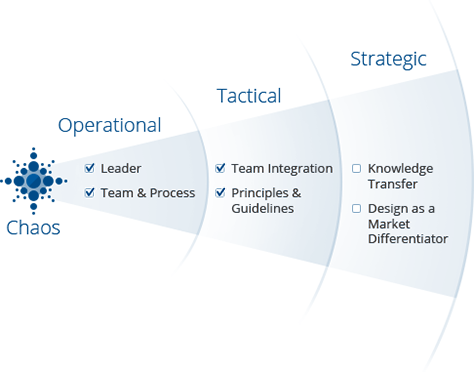 The members of the UX team serve as visionaries or product owners and influence strategic decisions on how to evolve a product, as shown in Figure 5. Knowledge about users and how they interact with product user interfaces helps the company to improve the whole product portfolio. The company learns from its mistakes. There is a unified knowledge base that documents how users work with the company’s products, ongoing competitor analyses, and design and technology trends. This includes analytics and user research data, market and competitive research, and customer feedback. The UX team defines KPIs (Key Performance Indicators) to track product design enhancements. These are tied to business KPIs and goals. New product and feature ideas come from the bottom up—from UX researchers and designers to product managers. The company has its own visual design and interaction language that influences the industry. Everyone on the product team has at least basic design skills, including developers, QA engineers, and managers. Design provides market differentiation as the company finds its own language of visual and interaction design. The company’s UX design patterns and solutions get copied by competitors. Visual and interaction designs leverage emerging trends and even help to launch design trends. The company’s product design influences the industry. To gain a broad understanding of the problem space, it would be helpful to examine some other existing UX maturity models. Figures 6–10 show some of these other existing UX maturity models. You’ll probably disagree with some aspects of these diagrams, but that's okay. There is no universal theory of anything, and there never will be. But these diagrams provide a good starting point for building your own UX maturity model. The higher your company’s UX maturity level, the better its products will be as a result. The higher your company’s UX maturity level, the better its products will be as a result. And it will be much easier to sustain this level of quality. While a company can jump levels of UX maturity, it’s likely to result in a short-term success that is hard to maintain. You wouldn’t want your company to backslide and lose all of the progress that it’s gained if you go away on vacation or leave the company, so try to strive for long-term goals. In the next installment of this series, I’ll tell you how to accomplish and sustain each level of UX maturity. 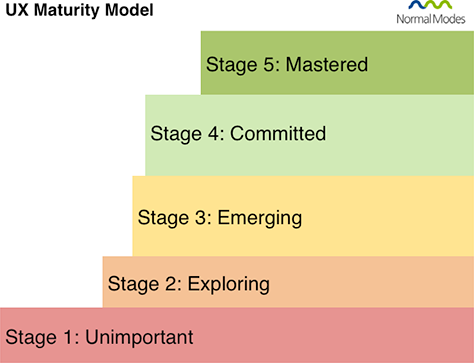 Hi—I have made a Web site for developing and sharing maturity models. It’s called GridMark.io, and it’s free to use. In a matter of minutes, you can set up your UX maturity model and get your clients or collaborators to fill it out by sending them a link. They get a nice report, and you can export the responses into Excel for further analysis. You may wish to give it a go. Thank you, Mehdi! It looks promising. I’ll try to create my maturity model here.